Welcome back to the blog collaboration of Deb and Celeste. We had so much fun every week in the month of October that we decided to continue this once a month. Also my friend, Lynne had asked if she could play along with us and that gave us the idea to have a monthly guest. So for the month of November, our guest is the wonderful artist, Lynne Mizera.. We hope that you will visit all three of our blogs and leave us some comments. Lynne got to choose the theme for this month and she picked SNOW.. I hope that you like my card -- the weather is finally getting chilly here, so I put on some holiday music and created this for you. On a Kraft card base, I first stamped the Hello Flags banner from Hero Arts on the left upper side of the card. The Sassy Snow stamp set from Skipping Stones Design had the perfect snowperson and sentiment for my card. Both images were stamped using Memories Black India Ink. I then cut a piece of white glitter paper to make a hill for my snowperson and the trees and adhered it with my Tombow MONO Aqua Liquid Glue. The banner was stamped on Merry Little Christmas paper from My Mind's Eye. I adhered several different patterns to the banner and also used some of the banners at the bottom of the card as trees !! Two red candy dots were used as tree-toppers and several snowflakes from my stash were also placed around the snowman. I used glitter markers to highlight the scarf, mittens and nose. 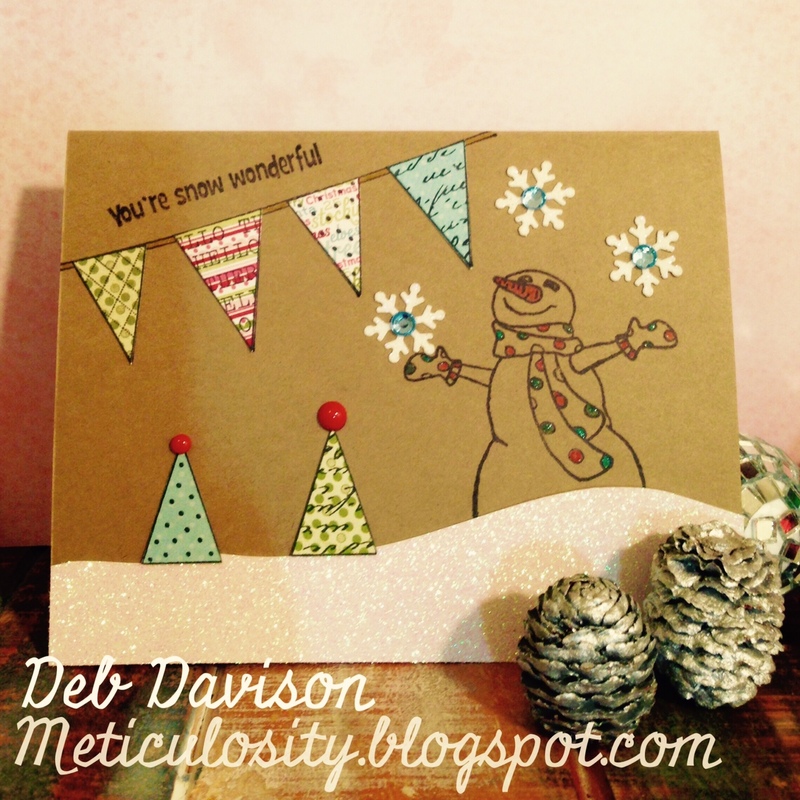 I also used the Sassy Snow stamp set for the Skipping Stones Blog Hop this weekend. Today's card -- in the spirit of SNOW -- was brought to you by a cup of Santa's White Christmas Coffee ( by Barnie's Coffee Kitchen ) and my 2011 Starbucks Holiday Fa-La-La-La ceramic tumbler. I rarely use this tumbler but this was a great opportunity to get it down off the shelf and enjoy my coffee in it !! Head on over to Crafting Junky to see what Celeste did with our SNOWY theme. And be sure to see what Lynne Mizera did with the theme she chose -- you can find her post here at Lynne's Art World. Lynne is an amazing mixed-media artist and her blog is full of fun from her studio, garden and kitchen, We are thrilled that she asked to join us as our guest this month !!! Take a moment to sign up to follow our blogs when you are checking out our cards. Celeste and I will be back next month with another guest .. And who knows, it could be YOU !! Thank you once again for visiting Meticulosity !! Love this adorable card Deb!!! Those snowflakes...wow! Wow! Loving your card for this collaboration, that snowman just makes me smile. Thank you so much for allowing me to play along with you two this month... I had so much fun 😊! What a wonderful card and i love kraftpaper. Yhe cup iswonderful too! Cuteness! And love the cup.